PriceHub Blog: What's Better Than a Hybrid or Electric Car? What's Better Than a Hybrid or Electric Car? How about a useable solar powered car? 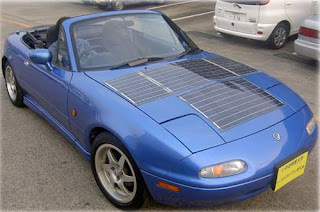 Check out this Mazda Miata that a few scientists in Japan converted into a 100% solar powered car. It has a range of about 18 miles and a top speed of 60 miles per hour. The conversion cost $21k USD but the fuel cost is a big fat zero. What Happens After a Car is Traded-In?